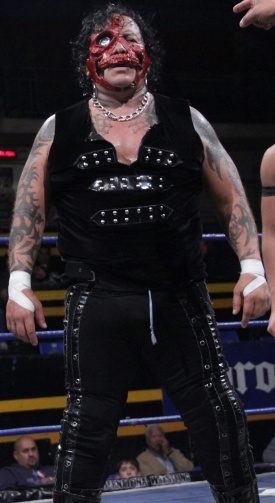 Gained fame as a member of los Infernales. Jumped to AAA & became one the top rudos. Now works predominantly in IWRG & on the indie scene with his Pirata Family. 97/12/22 hair Tarzan Boy Pirata Morgan Plaza de Toros Lauro Luis Longoria - Nuevo Laredo, Tamps. 99/??/?? hair La Parka Jr. Pirata Morgan Nuevo Laredo, Tamps. 01/05/24 hair (2) Sangre Chicana Pirata Morgan Plaza de Toros de la Caletilla - Acapulco, Gro. Al micrófono "El Mejor Luchador del Mundo"
This page was last edited on 3 October 2018, at 07:22.